Energy grid operator Liander and architecture group RAU find common ground in a sustainable office redevelopment in the Dutch town of Duiven. Liander has two goals; achieving a fully CO2-neutral operation and realising circularity of materials by 2023. Testament to this commitment is the Alliander/Liander building, in which several old offices were transformed inot one new building. The orle of architect RAU was key, due to its strong awareness regarding the design of sustainable buildings. Using innovative methods, BREEAM-NL in-use advisory group created outstanding housing from a complex of five existing buildings, which have been extended and encased in a ‘climate greenhouse’ with a floating roof. The Liander complex accommodates 850 flexible workplaces for 1550 employees, adhering to the new principles of work. The concept consists of maintaining and adapting existing buildings from an economic, aesthetic and ecological point of view. The energy consumption has been reduced and the comfort of the working environment increased. 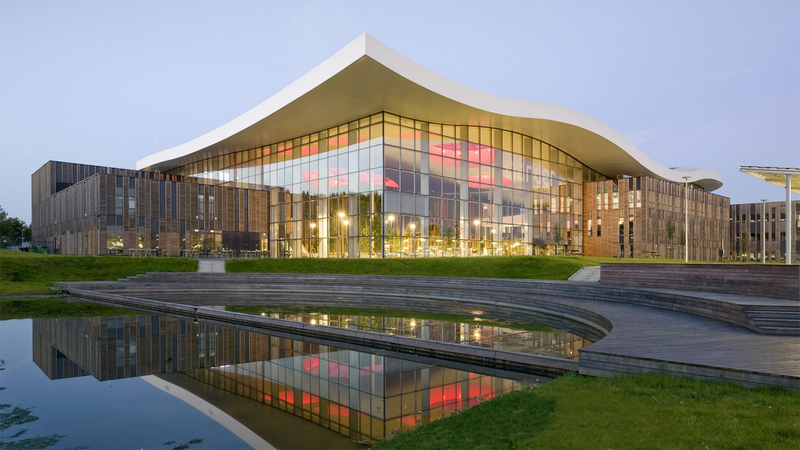 The combination of the glass atrium with air heating (BaOpt principle), a submerged heat pump and 10,000 square metres of solar cells results in a positive energy balance. The surplus of energy is shared with surrounding companies. Possibly even more important than the energy aspect, is the team’s comprehensive approach to material (re)use. More than 80% of the materials are recyclable. Rainwater is collected from the roof for cooling and to flush the toilets. Large circular openings in the roof allow light to penetrate the structure. 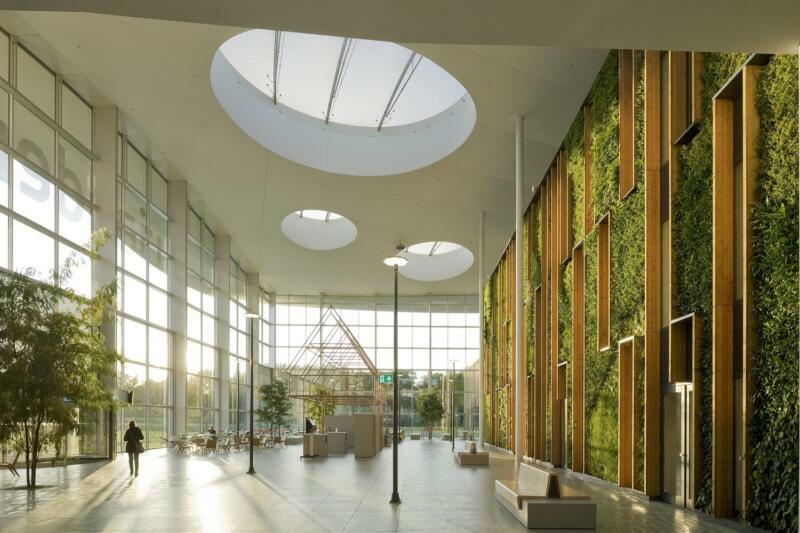 A green facade, trees and plants are a central component of the CO2 and moisture management and thus contribute to a natural and healthy indoor climate in the complex. Rau’s mission is to make a positive contribution to society and planet Earth. To Rau, architecture demonstrates and creates awareness of how human activities influence the built environment. A truly sustainable building is not just one that incorporates energy efficient technology and fulfils the standards of given sustainable certificates. Rau’s ambition exceeds the boundaries of the architectural challenge itself: The value and quality of life on Earth. It believes architecture must ensure that activities on Earth add value to the future instead of consuming recourses that can’t be replaced. The architecture of Rau is by definition the result of a unique design process. ‘Unique’ because each project different from the other and is influence by its participants, their personal inputs and the conditions given by the specific location. Its integrated planning method allows it to deliver the best possible building for the users, the clients and the location.